Bagels are not ordinary bread. After all they have a hole in. And they are poached before baking. 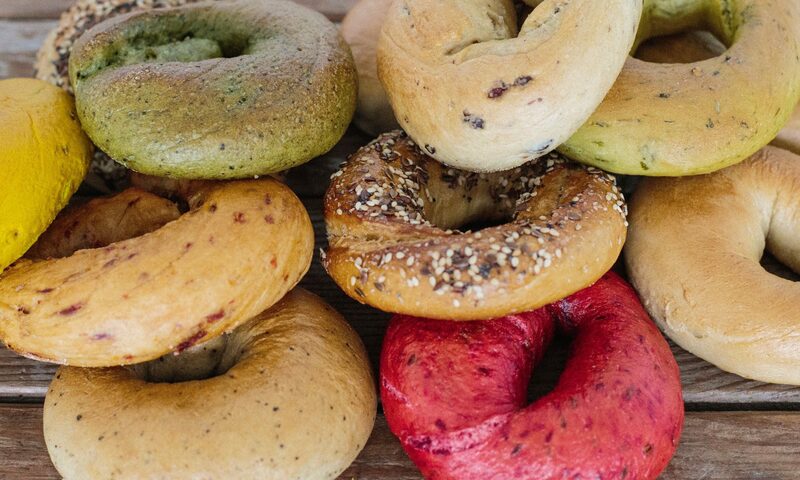 Later this week i am off to the wonderful people at The Bagelry to find out how they do it. It goes on and on (baked on burlap or baked on tray, flip or not flipped) – and you thought it was just some bread with a hole in. So here to get us started, a basic Sheffield Vegan Bagel. Its distinguishing features are that it is not a supersize (a la New York) or have a large hole ( a la Montreal) or left to prove in the fridge overnight (to be blogged about later…). It is the recipe (or nearly) that Claudia Roden has in her book of classic Jewish food. Prepare some trays with a some baking paper. You can dust them – i have used flour and seen advice to spray with a thin coat olive oil. But best effect in my experience is to use semolina which i saw first at Forge Bakehouse. Add the dry ingredients together and mix and make a well. Turn into a circle and pinch the two ends together and then grab some dough from where the pinch is made bring it over the top of the pinch as if closing an eye-lid. This makes the join neater and stronger. Wrap the dough snake around the widest part of your fist and with the overlap on the palm side bring your hand firmly on to the table and roll back and forward. Lay on the trays for about an hour in a warm place. When the proving is nearly done and the oven is ready, bring a large pan of water to boil. Add another dollop of malt syrup to the water. This helps the crust develop. Add each bagel to the pan for about 15 seconds a side. They should float straight away. Place on a cooling rack to drain. This is when you can add sesame seeds if you wish (or poppy seeds) by dipping one side of the bagel in a bowl of them. You do not need an egg wash! Now bake for about 20 minutes. Tip out when done and enjoy. Previous PostPrevious Don’t grow volts?